Muthill, Crieff, Perthshire, PH5 2AA. We went there on a hot, dry day, a rare thing indeed in this part of the world! The garden was at its most perfect. Little really has changed since that day in 1842 when Queen Victoria visited and you feel you are a timeless character wondering through a theatrical landscape. This is as good as it gets. In or around 1490 John, First Lord Drummond, Steward of Strathearn and Justice General of Scotland was granted permission by King James the Fourth to build a castle. In 1605 the fourth Lord Drummond was created the First Earl of Perth after helping to secure a peace treaty with Spain. The estate remained in the family of the Earls of Perth for several generations and when Clementina Drummond succeeded her father Lord Perth in 1800 and married in 1807 the family name became Willoughby de Erseby. 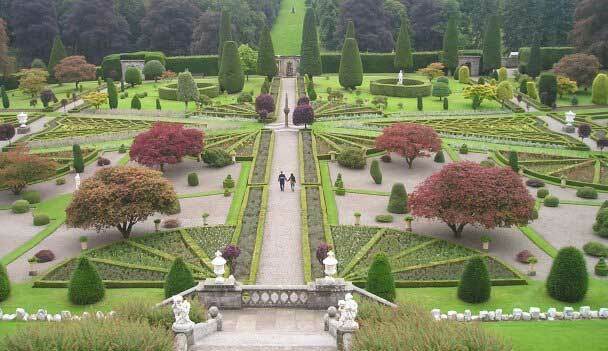 According to records a significant garden must have been in existence by 1605. In 1654 the castle was attacked and partially demolished by Oliver Cromwell as the Earl of Perth were ardent Royalists. 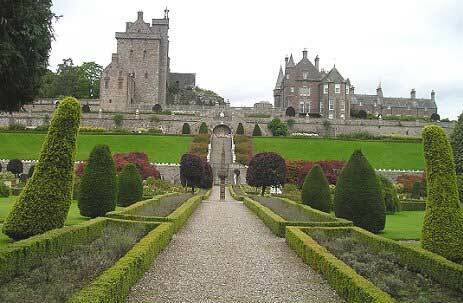 The Fourth Earl employed John Reid in 1675 as his gardener. He became well known for writing “The Scots Gardener” in 1683. during the Eighteenth Century the garden schemes were interrupted many times by wars, notably the Seven Years War” and political issues of the day. In 1785 by the time the family regained the estate from the Crown Commissioners the Landscape School Style had taken over in major gardens. 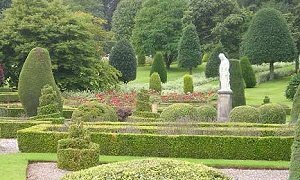 In the Early Nineteenth Century by the time Clementina Drummond and her husband took over the estate there was a revival in the interest of formal gardens and it was they who laid out the terracing and parterre work which is one of the most significant of the early Victorian period in Scotland. 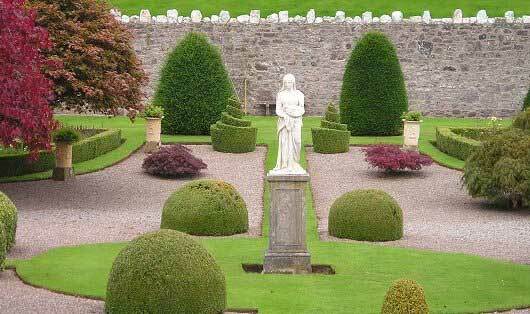 The main gardener who worked with them was Lewis Kennedy, who had once worked for the Empress Josephine at Malmaison. The architect and landscape designer Sir Charles Barry made many watercolours of the gardens and castle and he probably suggested some of the more architectural parts of the garden. take tea in the garden. 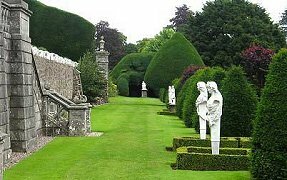 One historical thing to note however is the John Mylne Sundial which is located at the exact centre of the garden and which was erected by the Second Earl of Perth in 1630, The different faces of the sundial show the times in many different capitals of the world. 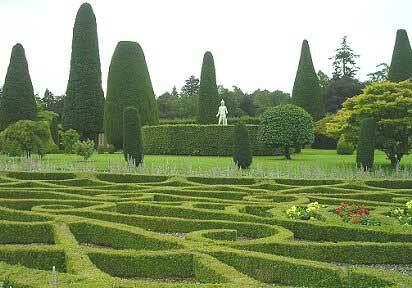 If you only visit one topiary garden in Scotland this is it!